Apex Fasteners has a broad variety of rivets and riveting products available for your applications in both metric and imperial sizes. Rivets provide a simple and inexpensive means for attaching relatively thin materials. Eyelets and grommets are similar in function to rivets in that they help secure thin materials. However, they also provide reinforcement for holes through such materials, allowing for uses beyond mere attachment. 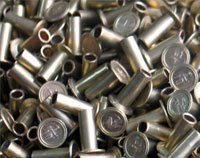 Our staff will work closely with you to determine the best fastener for your application. Eyelets and grommets, like rivets, provide a means for holding together thin materials. However, eyelets and grommets offer the additional feature of providing a reinforced hole through such materials. They come in a vast range of shapes and sizes from round to oval, circular holes to square and rolled flanges to flat. Eyelets and grommets provide strength and durability to materials such as paper, card, thin plastic, fabric and leather. They are used in a broad range of applications from ring binders to carpet swatches to shoes to tags. Eyelets and grommets are installed with an appropriately sized die set employed in tools ranging from large-volume automatics down to simple hammers. Eyelets differ from grommets in that eyelets typically come in a broader range of shapes and sizes, whereas grommets tend to have larger flanges. Grommets tend to be used in applications requiring additional strength and are most commonly used in association with matching washers, including plain washers, teeth washers and neck washers, that serve to reinforce the strength and stability of the attachment from the side opposite the grommet. Plastic rivets, snap tacks, christmas trees, mini rivets, arrow clips, key hole clips, anchors, snap clips, ratchet fasteners, plastic pins, screw rivets, dome and tacks, panel clinching rivets, grommet nuts, bushings and push-in fasteners or some of the many types of plastic fasteners that can secure relatively thin materials. Plastic rivets and rivet-like fasteners are often used in applications that require lightweight solutions, have conductivity issues, require ease of installation or require removability. 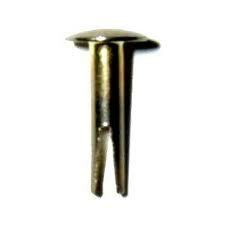 Rivet nuts or rivnuts are used to provide a permanent threaded anchor point in thin materials such as metal, fiberglass and plastic. A rivet nut is set using a tool mandrel by threading the rivet nut onto the mandrel, pulling the mandrel to set the rivet nut then unthreading the tool mandrel. Once in place, the rivet nut provides captive threads that will not loosen under vibration or rotate. Ribbed rivet nuts provide extra torque strength over standard rivet nuts thanks to its knurled expansion surface. Rivet nuts are also available with flush-mounting heads. Apex Fasteners provides riveting tools and dies for all rivet products. Riveting tools for solid, semi-tubular, and all styles of blind rivets. We also have dies and presses to set grommets and eyelets. Please contact your Apex Fasteners representative for additional guidance in selecting the right tool for your needs. Semi tubular rivets are not set using a mandrel. 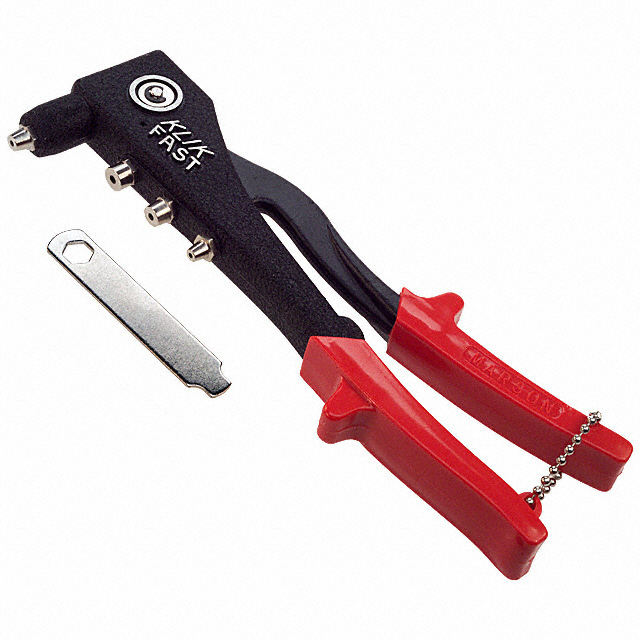 Rivet tools, containing an appropriately sized die set, provide the compression that sets the rivet. Access to both sides of the application is therefore necessary. Semi tubular rivets are solid for a portion of their length and then hollow or tubular near the end that is peened or "rolled up". Similar to semi-tubular rivets, solid rivets are set with dies rather than mandrels and require access to both sides of the application. Solid rivets are solid throughout their length. Split rivets, also known as T-rivets, provide additional grip support and pull-out resistance by splaying out into three wings when inserted. The mandrel, when pulled, causes the end of the rivet to separate into three wings, much like a flower blooming, which are then flattened against the blind side of the application. Unlike tri-fold rivets, split rivets do not remain attached to the base of the rivet and so they form a single thickness of material once set. 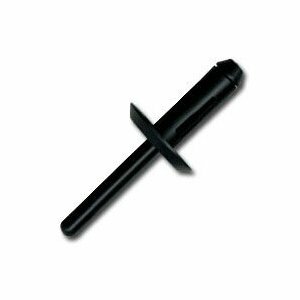 Blind rivets are utilized in applications where one side of the desired connection point is not easily accessed. Blind rivets contain a mandrel which is pulled towards the rivet head in order to set the rivet. The base of the mandrel bulges the end of the rivet as it is pulled inside the rivet, providing a secure grip against the underside or "blind" side of the application. The mandrel is then sheared off flush with the rivet head and ejected leaving behind the low profile visible head of the rivet. Blind rivets come in a variety of types including open-end rivets, closed-end rivets, tri-fold rivets, split rivets and multi-grip rivets. A high strength structural blind rivet offers advantages over conventional blind rivets: higher sheer strength, wider panel range, and depending on the style chosen they can also offer self-plugging, hole filling features or in the case of soft and brittle materials a large blind-side head in our tri-fold series. For the truck and trailer industry rivets are available with a shaveable head so that repairs will match the brazier series common in the industry.